The full-size, 22-fret, 24 ¾” scale instrument is folded by releasing a concealed lever that relieves string tension and unlocks a hinge. The neck then folds away from the playing position. 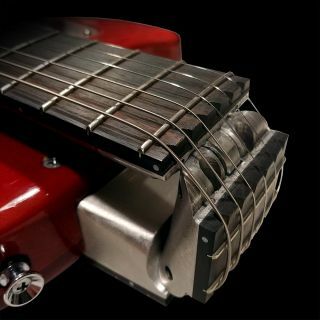 To return to full size, the user straightens the neck and return the lever to its concealed locked position, returning tension to the strings and locking the hinge. Other features of the Ascender include a single cutaway, soft “C” style neck profile, Gotoh locking tuners and Seymour Duncan ’59 neck and bridge humbuckers. One particularly cool facet of the guitar is what Ciari calls “improved string management”: With the Ascender in travel mode, the strings remain aligned in subtle grooves built into the fingerboard at the hinge in order to keep them organized. The Ascender was crafted in cooperation with Joe Glaser of Nashville’s Glaser Instruments and is constructed using Plek neck technology. For more information on the Ascender, head over to Ciari Guitars.